This dark-brown neck strap features a set of 11 petal bells from the early to mid 1800s. Many were cast by Seth North, makers mark "SN". He operated his own foundry from 1801 through 1830 in New Britain, Connecticut. 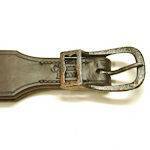 The strap is about 56 inches long from buckle to tip. It is wider than most straps -- at 2 inches -- to support the massive 3 1/8" center bell. The strap tapers at the end to 1 1/4" to fit the unusual decorative buckle that I reused on the new strap. "Keeper loops" between each pair of bells hold the bell strap and lining strap together.